Radiobioconjugate therapy is an emerging modality for Cancer in addition to conventional surgery, chemotherapy & external radio-therapy. The central problem of radio-bioconjugate therapy is the small fraction of radio-bioconjugate localized in the tumour. Pretargeting is one approach to maximize targeting in which an antibody construct, having a dual affinity both for tumour associated antigen as well as for a radio-labeled moiety is first administered followed by the radio-labeled moiety, which may be either biotin or a metal chelate. The relative merits of these are described & Rhenium-Re 186/188 , Gold-Au 199 & Lutetium-Lu 177 are suggested as candidate therapy isotopes in such pretargeting approaches. 3-bromo-(2,4,6-trimethylphenylcarbamoylmethyl) iminodiacetic acid (3-bromo-2,4,6-trimethyl HIDA) was synthesized, and lyophilized vials were prepared which contained 20 mg of 3-bromo-2,4,6-trimethyl HIDA and 0.4 mg of SnCl 2 . Radiochemical and biologic studies showed that this agent was obtained in high radiochemical purity, were stable in vitro and in vivo conditions. The compound, 99m Tc-3-bromo-2,4,6-trimethyl HIDA, possessed high hepatic specificity meaning that none of the tissues except for the hepatobiliary system showed radioactivity concentrations, and rapid hepatocellular transit and a rapid clearance from the blood circulation was observed. In conclusion, a lyophilized kit of HIDA and its labeling with 99m Tc can be applied as a hepatobiliary imaging agent for the evaluation of the functional status of the hepatocytes and the patency of the biliary duct. Somatostatin receptors are over expressed in several neuroendocrine tumors making these receptors potential targets for radionuclide diagnosis and therapy. Indium-111 - DTPA octreotide is a somatostatin analog that has been used for detecting somatostatin receptor positive tumors for years. Somatostatin receptor scintigraphy and octreotide therapy have changed the management of neuroendocrine tumors. The object of this report is to highlight the role of radionuclide scintigraphy and therapy in neuroendocrine tumors. Gene resistance is one of the major obstacles in the treatment of patients with chemotherapy. In this study we have tried to corroborate the wash out rates of Sesta Methoxy Iso Butyl Isonitrile (MIBI) from the tumour to the presence of Multi Drug Resistant (MDR) gene in the tumour cells. Method: 51 patients were included in the study before they began any treatment. We did a baseline scintimammography before any biopsy was done. A second scan was done a month after the completion of chemotherapy and radiotherapy. The wash out rates have been calculated in the pre and post scintimammogram. Result: We found that all our patients had wash-out rates greater than 60% and yet had responded clinically to the treatment regime. Conclusion: Discrepancy could be ascribed to heterogeneity of the tumours, subsets of cells expressing varying and multiple resistant mechanisms may co-exist. Reduced blood flow to the tumour could be held accountable for poor penetration of MIBI in patients. As new methods of diagnostics are being invented every day, the limitation of every field is being complemented by another method. No field has remained exclusive in itself. A classic example is of the development of Functional Anatomical Mapping (FAM). 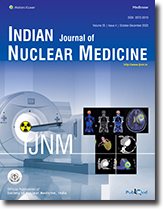 This technique uses the functional information obtained after a Nuclear Medicine procedure and combines it with a high resolution morphological information obtained by a CT scan.The development of hybrid machines has blurred the boundaries of Nuclear Medicine and Radiodiagnosis. But these new machines are prohibitively expensive and many upcoming centers are not in a position to use these methods. As an alternative to a combined single step acquisition, we tried to map and match the data of the same patient obtained from separate CT and Nuclear Medicine studies.Having acquired the information separately, the images were manually fused to give a FAM image. This is only the first study of its kind and we hope to refine the method further to give more accurate reports. We conclude that this is a viable method, though more number of studies need to be performed before accepting it as a true alternative to single step FAM study. Scintigraphy with Technetium-99m methylene diphosphonate (MDP) delineates a wide spectrum of nonosseous disorders. 99mTechnetium-methylene diphosphonate (MDP) bone isotope may accumulate in many extraosseous sites due to variety of both benign and malignant conditions. Neoplastic, hormonal, inflammatory, ischemic, traumatic, excretory, and artifactual entities demonstrate abnormal soft-tissue uptake of Tc-99m MDP. Mechanisms leading to increased extraosseous Tc-99m MDP uptake includes extracellular fluid expansion, enhanced regional vascularity and permeability, and elevated tissue calcium concentration. Usually metastases in the liver shows focal rather than diffuse uptake of Tc-99m MDP. Recognition of these modes of extraskeletal Tc-99m MDP uptake can enhance the diagnostic value of bone scintigraphy.